It is not known if this scam has reached New Zealand. On Wednesday, I approached my car from the passenger side to place my computer bag on the front passenger seat. As I reached to open the door I noticed there was a hole right under my door handle. My first thought was, “Someone has shot the car !” I began to think about it and inspect it a little closer and the “light” slowly began to dawn. I then placed a call to my insurance agent and explained it to him. I was puzzled that they left my GPS and all other belongings. Here is where it gets scary ! Periodically, walk around your car, especially after you park in a shopping center or other large parking area. Report thefts immediately….your bank w/missing cheque numbers, your credit card agencies, police, and insurance companies, etc. Here is an image of what the hole may look like. 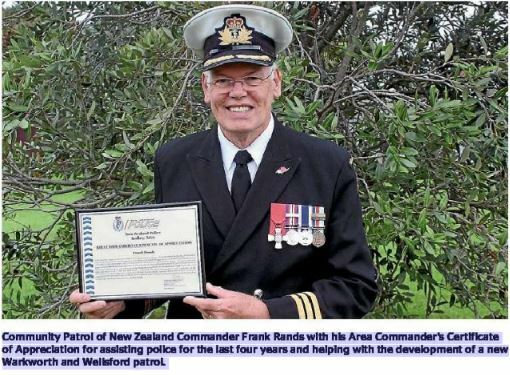 Rands was honoured for his efforts in recruitment and training of community patrol members to assist police in Rodney over the past four years, and his guidance and assistance in the development of Warkworth and Wellsford CPNZ which began patrolling this April. All CPNZ patrollers are invited to march with Police for the Anzac Day service at the Silverdale RSA (11am service). 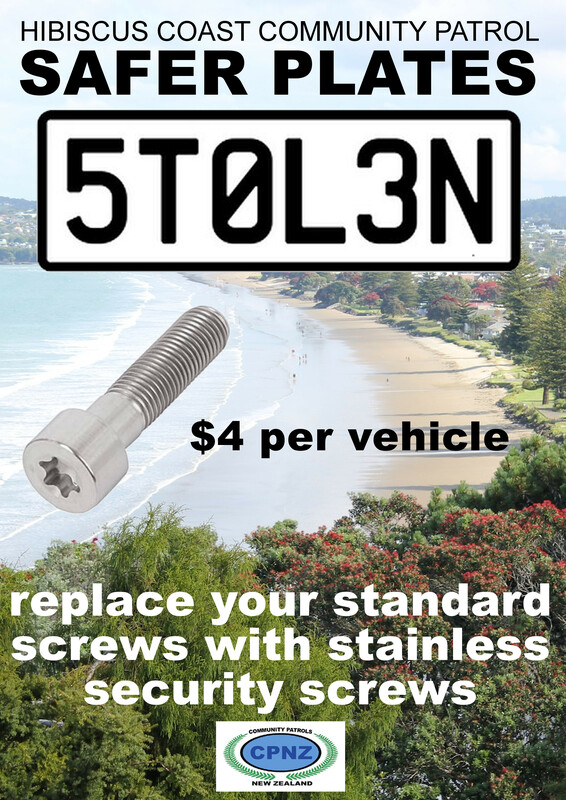 The Hibiscus Coast Community Patrol has commenced a programme to prevent the theft of licence plates from vehicles. 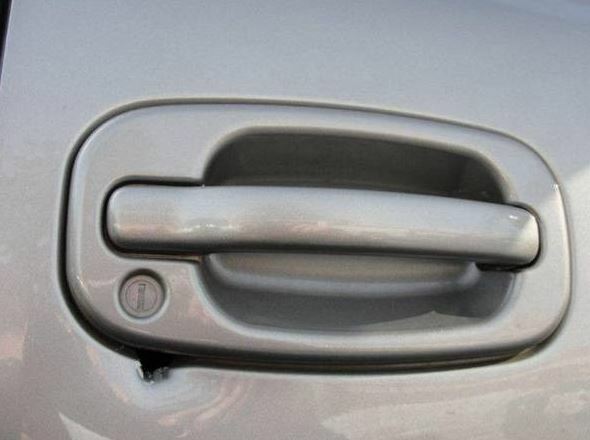 This programme is known as ‘Safer Plates’ and is accomplished by the removal of the standard steel screws which hold the number plate to the vehicle and replacing them with stainless steel screws with a special head. If you wish to take up this initiative, the Patrol will be on Millwater Parkway beside the Sales Office (opposite Silverdale Primary School on Sunday, 2nd November from 10am until 12 noon. So come on, drop in and the job will be completed in approx 4 -5 mins. $4 per car and all proceeds go to supporting your community patrol which will ensure our community is safer. See you there. 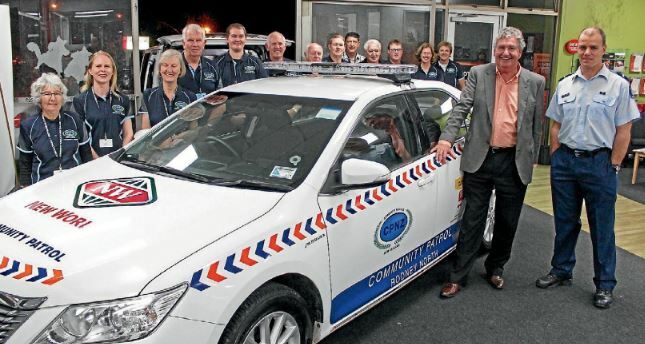 Two members of the Hibiscus Coast Community Patrol received National Awards. 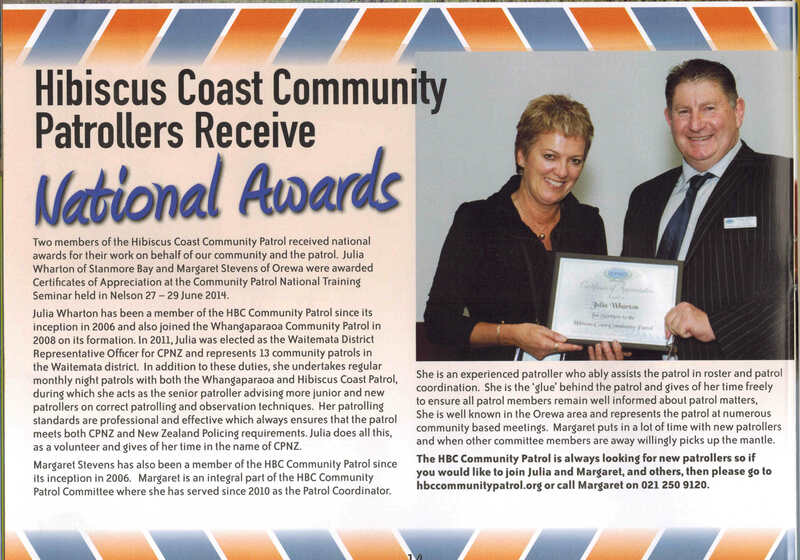 Well done to Julia and Margaret. See full article for details. Thanks to Allthingslocal. Click HERE for a link to Destination Orewa Calendar.